RATON -- The Department of Game and Fish is asking the public for help finding the person who shot a deer fawn with an arrow in mid-January. 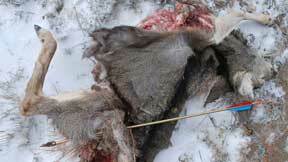 The dead fawn was found Jan. 16 on Nelson Road in Raton with an arrow through its stomach. The deer had been scavenged after it died, making it is very difficult to determine when it was shot. It was also hard to determine how far the fawn could have traveled with the arrow lodged in its abdomen. The Department is looking for any information about this crime. Please call the Department office in Raton at 445-2311 or the Operation Game Thief Hotline at 1-800-432-4263. Callers can remain anonymous and may be eligible for a $500 reward.